I have your plugin installed on my website and the wholesale pricing is working but the functionality of hiding a product to visitors is not working. I want to be able to have certain products hidden from everybody but approved wholesale customers, and I can’t seem to get it working. Hi Dan, I’ve replied to your e-mail, see below. I have the same question that Shelly asked back on November 8th. Can we get an answer to this please? Is it possible to see old price of product (before adding to cart) and new wholesale price together in shopping cart? I am trying to implement but with no luck. Hi Ivana, as Wholesale Pricing overrides the WP e-Commerce Price controls on the Products Page/single Product page you’ll need to query the price directly. – it works for one product in shopping cart(i added the code in : wpcs_cart_widget), but when I add another product in the cart it is showing the old price of last added product for all products in the cart. Any idea how to override this? Hi – we have purchased this plugin. It is correctly updating price for variations only but not for the default product price. We have latest version of wp-ecommerce and from your read me file it looks as though we do not need to follow any steps to update the core wp-ecommerce plugin. Please confirm. which is $100 but should be $150 with 50% markup for all user levels. It only changes to $150 when a variation is selected. Are you able to let me know if you have come across this problem before? Hi! I’m wondering if this plugin can be used to help calculate profit in the sales dashboard. It seems that, if we have a wholesale price per variation, and the variation retail price, it should be possible, no? Sadly, my PHP skills are not yet so advanced that I can write it myself, but I wonder if you can convince the wp e-commerce folks to include profit reporting in conjunction with your plugin? It would be awfully nifty. I’d love to have profit calculation on WP-Ecommerce dashboard. Any news about the work-in-progress thing you said on novembre 22? Thanks for the great work on WPEC. Will this plugin be compatible with a theme that utilizes WP Ecommerce? Hi Michael. I’ve upgraded to 3.8.7 and things are working well so upgrading solved the problem of not displaying the fixed pricing on my site. I’m about to tackle Variations but I have a few questions. 2) Does the wholesaler plugin allow you to configure which variations appear as options depending on the role of the shopper? I’m asking because I need my wholesale shoppers to have the option to add frames (as the variation) to the prints that they order but NOT have this option available to or even seen by any other shopper roles. 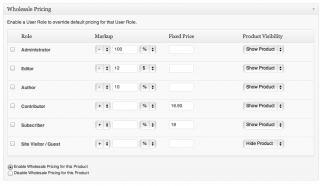 With this plugin, do you have the capability to create custom/wholesale shipping? My take on this for a site I’m finishing up and this is the last thing I need to figure out. the site will generally only sell a single or at most 2 items to retail customers but wholesaler orders will be multiple items per order. Ideally if Wholesale customers could be limited to Table Rate only. that would awesome. Is volume-based discounting coming soon? This is the functionality I need: it would be great to get an idea of when it might be implemented. Hi vikash, I’m testing the latest Wholesale Pricing against 3.8.7 to confirm if support has been added by the GetShopped.org team; removing the need for changes to Core (WP e-Commerce) files. I’ll update here shortly. I have a problem with my product variation price as well, since I updated to wpec 3.8.7.1. When I update a product variation, the price of the last product on the page is updated .. maybe this is your problem as well? also, in addition to my issue above, in the instructions 3.6 Replace the following snippet “$sale_price = get_product_meta($product_id, ‘price’, true);” on line #1811 in /wp-content/plugins/wp-e-commerce/wpsc-includes/product-template.php – this snippet doesn’t exist? 3.2 Copy the following snippet and paste it above “$args = array( … );” on line #409 in /wp-content/plugins/wp-e-commerce/wpsc-includes/product-template.php – I dont see this on line 409, its 405. Hi Nicole, please ensure you either delete the existing Plugin files and upload a fresh copy if you’re updating via FTP or use the WordPress Plugin updater. I cannot reproduce this fault so suspect some files have not been copied during the update. In “plugins/wp-e-commerce-wholesale-pricing/wholesale-pricing.php” on line 106 remove the first backslash. Hi bnance63, this fix has been cooked into the 1.6.6 Plugin update. Dashboard > Wpec > Wholesale Pricing, but now all I get are those two error statements. This happened after giving Michael access to the wp-admin of my site so he could fix the “Fixed Pricing” function of the wholesale plugin. Fixed Pricing still doesn’t work and now these errors on the admin page for the Wholesale Plugin. I’m totally at a loss as to why it isn’t working and why I haven’t gotten a response this whole week. Have you noticed how a product that has been set for a fixed price for wholesale users shows up as $1? Beetle Chase, which is the first print on the Prints page is regularly $40 but has a wholesaler rate of $50. But when logged in as a wholesaler, the price says $1. I’ve been using your wholesale plugin for awhile with no problem. I now want to set a specific wholesale for certain products rather than just using a general % for all wholesalers. If I understand correctly, I should be able to do this while editing a product using the wholesale widget at the end of the product edit section. However, when I change the Wholesaler role’s markup to + 150 $ and then click the “Update Product” button, the change is not noticeable when logged in as a wholesaler. The regular price just shows. 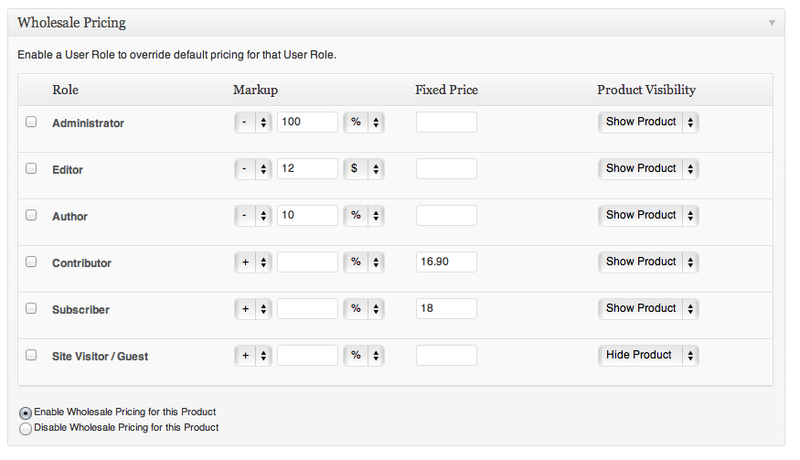 In the Pricing Settings (Store > Wholesale Pricing), I have Wholesaler role checked but just the default settings. 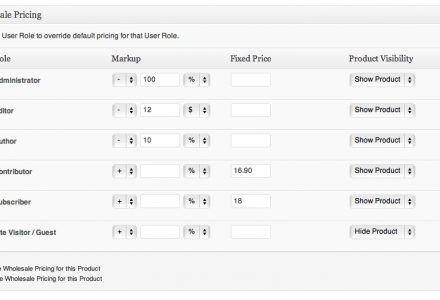 I forgot to mention, I’m using version 1.6.3 of the Wholesale Pricing plugin. How do I go about getting or updating to version 1.6.4? okay, so I figured how to get the update. I’ve updated the plugin but I’m still having the same problem. I can’t override the default price with a product specific amount I enter in the product editing section of a specific product. As a matter of fact, any amount that I enter in the Fixed Price field for a user role disappears after I’ve pressed the Update Product button. Hi jimario, it sounds like the fixed price under WP e-Commerce 3.7 isn’t being saved to the database from the Add/Edit Products page. I’ll take a look at this now and prep it for release this weekend. Can you verify the instructions for updating the product templates for hiding/showing products? Does the your function call come before or after the beginning of product loop? Does it replace part of the loop? My files have code on the stated line numbers, so I’m not clear where you code should go. I have tried it everywhere I could think of and it breaks the site. Follow up questions. Do we need an endif anywhere? Hi Brad, you’ll need to place a ‘< ?php endif; ?>‘ at the end. I’ve updated the readme.txt to reflect this, here’s a copy. 1. Paste the following snippet on line #67 of wpsc-products_page.php (the line immediately after < ?php while (wpsc_have_products()) : wpsc_the_product(); ?>. 2. Paste the following snippet on line #227 of wpsc-products_page.php (the line immediately above < ?php endwhile; ?>. 1. Paste the following snippet on line #30 of wpsc-single_product.php (the line immediately after < ?php while (wpsc_have_products()) : wpsc_the_product(); ?>. 2. Paste the following snippet on line #214 of wpsc-single_product.php (the line immediately above < ?php endwhile; ?>. Thanks for looking into this. Hiding products seems to work for Administrator roles, but not visitors/guests. I have Wholesale Pricing enabled and checked all of the user roles. When I select “Hide Product” for the Administrators, it does get hidden. However, for the Site Visitor/Guest it does not. Any other ideas that might help me resolve this? Is it already possible to hide product for the Visitor/Guest role? It’s not working for me now, I’m running the latest version of Wholesale pricing. Hello! I am working on this site for a client and need to get the wholesale area working as quickly as possible as it is really important for her business. Unfortunately I cannot get the plugin to work – I’ve gone through the instructions, updated the wp e-commerce plugin with the new code, and read through the forums. Can you please help me figure this out? When I set any of the settings on the back-end of the site – it does not reflect any changes on the front-end. I can’t get the wholesale prices to display. I am trying to implement the code changes in the text file. But it doesn’t seem to change my site. Can someone help or post there code? This isn’t working still. One issue is that I cannot find this in the php to change. The price will display once you choose a variant but I would like it to display the price before you choose your variant. Also, I can’t get it to display the new price on the product listing page. I downloaded the update. Has the readme changed?